Christopher Haw was born in South Africa in 1941. 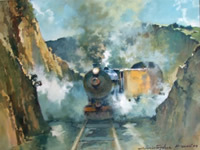 He is one of South Africa's leading realist impressionists and has been called "one of South Africa's last great masters". He is a Fellow of the Water Colour Society and among numerous awards also winner of the prestigious Oppenheimer Award for an oil painting named "Girl Reading". Christopher has exhibited extensively in Africa, St James' Gallery in London and Milan, Italy where he was lauded Master of his field. Art South Africa Today became recognised as an important national exhibition series between 1963 and 1975. The Exhibition was open to all races, and work was selected on merit – entries were received from established artists nationwide. It certainly caught the attention of the security police. Until then almost all art exhibitions and competitions had been held separately for different races: this was the first time in then Natal that the work of black artists was integrated into a major South African exhibition. These were the dark days of apartheid, when mixing between black and white people infuriated the state. Irma Stern won the Earnest Oppenheimer Award in 1963 for her controversial painting Drawing Water which sparked an outcry. It was felt by many that conventional representational art had been excluded - despite the fact that there were many perfectly 'under­standable' paintings, graphics and sculptures. Art South Africa continued to make history as it paved the way for things to come. More black artists entered the competition and won awards and recognition. Other well known names snubbed the prestigious competition – some because their work had not reached the final selectors list in previous years. Legendary American art critic, Clement Greenberg, agreed to be the sole selector for the 1975 Art: South Africa: Today, while visiting South Africa. Greenberg was considered one of the most important critics and writers in the art world in the 1950s and 1960s, and was a selector for national competitions around the globe. Greenberg awarded the 1975 Earnest Oppenheimer Award (major Anglo American prize) for a straight forward oil painting Girl Reading by Christopher Haw. The following year, 1976, was a watershed year in South African history, marked by uprisings in Soweto schools against the use of Afrikaans as a medium of instruction, and the deaths of many protesters. It was the beginning of mass resistance to apartheid. Affected, however, was the next planned Art: South Africa: Today exhibition. It is possible the exhibition had run its course anyway, and that the psychological effects of the 1976 tragedies were merely a final reason to cancel it. National exhibition series have a limited life. Art South Africa Today exhibitions had made their mark on the South African art scene - and had opened the doors to more representative participation by artists of all races. Today Christopher Haw still resides in Kwa Zulu Natal. Despite a few health obstacles over the years he became a well known and much loved artist at the annual Art in The Park event in Pietermaritzburg. 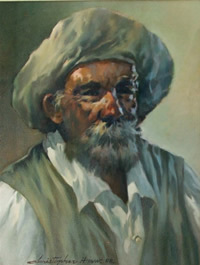 He exhibited extensively throughout South Africa and Harare as well as internationally, including St James Gallery in London, Milano, Italy (where he was lauded Master of his field) and in the United States. His work can be viewed on the South African Artists website. His agent, Michelle Dillman can be contacted on 083 4686968. Clement Greenberg called him “one of the Last Great Masters”. Indeed we agree and pay tribute to this great realist impressionist.